The Phylum Echinodermata is home to the asteroids (sea stars), ophiuroids (brittle and serpent stars), echinoids (sea urchins and sand dollars), holothuroids (sea cucumbers and apples), and the feather stars and sea lilies (crinoids), all of which share a few distinctive common features despite their highly variable appearances and lifestyles. While there are a few odd exceptions, all of these have a body plan based on a five-fold radial symmetry, meaning the members of the phylum generally have a body that can be divided into five (or a multiple of 5) roughly equal parts, which are laid out around a central axis. If present, the number of arms, spines, or other structures that protrude from the body typically come in multiples of five, as well. The most obvious example is a typical sea star, which bears five equal-sized arms radiating from its central body. All members of the phylum also posses a water vascular system, which is a collection of fluid-filled tubes and bladders used for respiration and circulation that also gives rise to numerous tube feet (podia) used for locomotion and feeding. Again, looking at the underside of a typical sea star is a good way to see part of the water vascular system in the form of its sucker-tipped podia emerging from grooves in its arms. 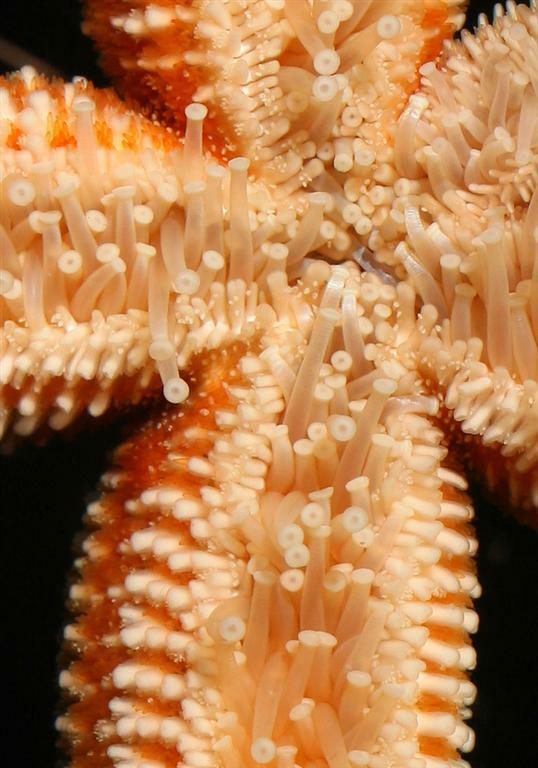 Here you can see a sea star’s five-fold radial symmetry and sucker-tipped tube feet, the hallmark characteristics of typical echinoderms. In the case of crinoids, there are approximately 625 living species (Brusca & Brusca 2003), all of which have a small organ-holding central body called a theca, with numerous long arms/rays radiating from it. These arms are used primarily for feeding and sometimes for locomotion, and there are oftentimes five or ten of them. However, these may branch repeatedly near their base, eventually giving rise to as many as 200 arms (Clarkson 1987). Interestingly enough, Shibata & Oji(2003) found that this increase in arm number sometimes occurs during development as a single arm is intentionally dropped at its connection to the body, after which two new arms grow from the point of detachment. This can apparently occur repeatedly to produce the number of arms possessed by an adult. Crinoids often have only 5 or 10 arms, but may possess as many as 200. Each of these arms is also covered by numerous small branches called pinnules, and both the arms and their pinnules are lined with rows of tiny food-grabbing podia. The pinnules and arms also have grooves that run down their centers, which are used to transport collected food particles to the mouth at the theca. On the bottom of the theca, most crinoids also possess a series of short non-feeding tentacle-like appendages called cirri. These are used to walk around and also act like grasping legs, which can hold onto the substrate. On the left you can see a relatively thin arm running horizontally across the photograph, with pinnules emerging from it vertically. The thin and sucker-less podia are also visible. In the middle and on the right you can see the tentacle-like cirri used for locomotion and grasping. It’s the long, slender, feeding arms covered by the smaller pinnules that make many crinoids appear to be a small body surrounded by numerous feathers. So, once you take a look at one it’s easy to see where the common name feather star comes from. Do note that these feathery arms can be rolled up tightly at times though, and aren’t always extended out from the body. These stalked species are typically called sea lilies, as they resemble flowers on a stem, but there aren’t very many of them around today. 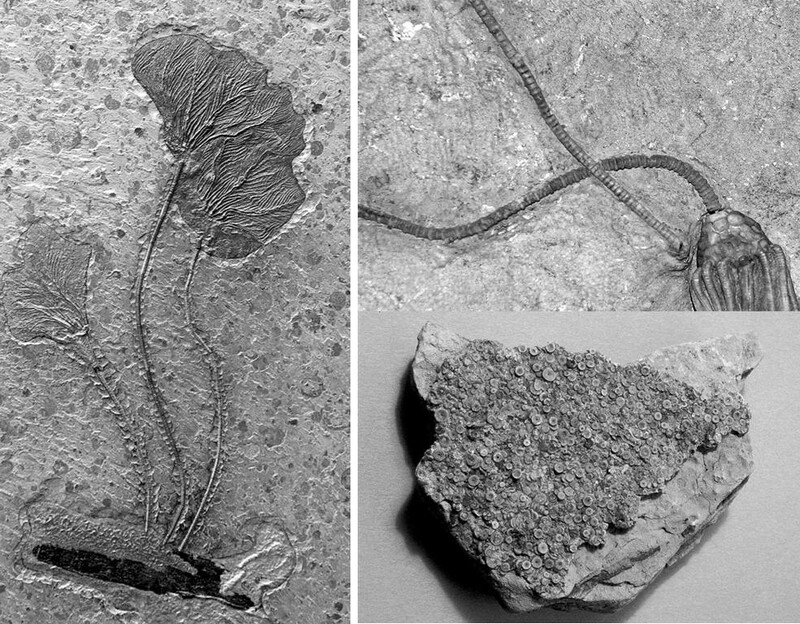 While there are over 6,000 described fossil species of sea lilies, almost all of these were wiped out during the great mass extinction event that occurred about a quarter-billion years ago. In fact, only 95 species or so are extant (UCMP undated, Roux et al. 2002). These are hard to come by too, as almost all of them live at depths greater than 100 meters, with many living on the abyssal plains at depths greater than 6,000 meters (Fossa & Nilsen 2002). So, I don’t think you’re going to be seeing any of these for sale at an aquarium shop. Note that the arms can be loosely to tightly rolled up at times, and that some crinoids have long stalks that allow them to hold their crown of feeding arms well above the substrate. Crinoids are passive suspension feeders that consume food items captured from surrounding waters, being passive because they don’t generate any sort of current themselves. Instead, they let the water bring food to them. However, they can change their location, overall orientation, and arm and pinnule extension to maximize food collection under different environmental conditions. Also note that some species apparently prefer strong currents while others prefer lower to weak currents (Meyer 1982, Meyer et al. 1984, Baumiller 1997). When feeding, the adhesive podia emerging from the arms and pinnules snare food items, sometimes with the assistance of mucous threads, and then pass them into the grooves that line them. Cilia in the grooves then guide the items to the mouth where they are ingested (Nichols 1960, Byrne & Fontaine 1981, Meyer 1982, Holland et al. 1986). So, what is it that they eat? Lots of things, with diets being highly variable from species to species. Known food items include: particles of detritus, ciliated protozoans, diatoms, foraminifera, and crustacean zooplankton, as well as several types of eggs, embryos, and larvae, with most all items being in the range of 0.05 to 0.4mm in size (Rutman & Fishelson 1969, West 1978, Meyer 1979 & 1982, La Touche & West 1980, Holland et al. 1991, Fossa & Nilsen 2002, Kitazawa et al. 2007). Crinoids typically sit in place with their arms extended to feed. However, as noted above, they can ball up when not feeding by rolling their arms up into tight coils, or by wrapping them around their body. 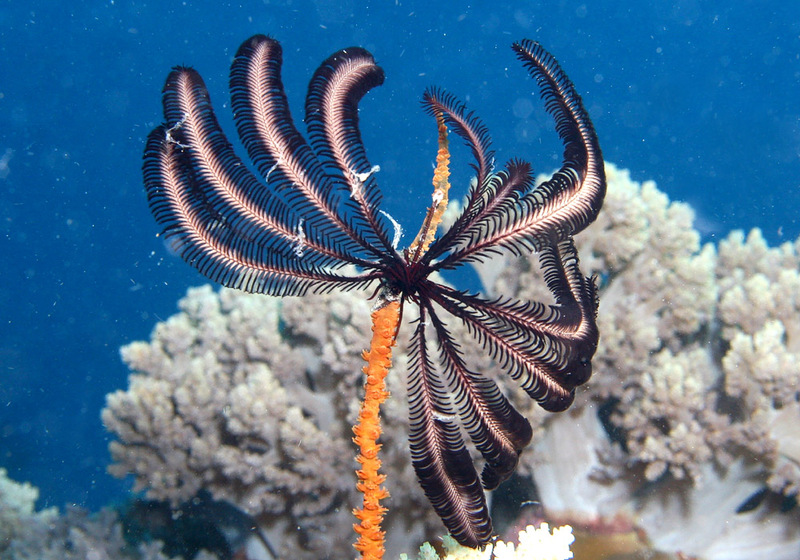 Feather stars can also crawl around by using the cirri on their underside, and as mentioned above, sea lilies can also crawl about using their arms and/or the cirri on their stalks. 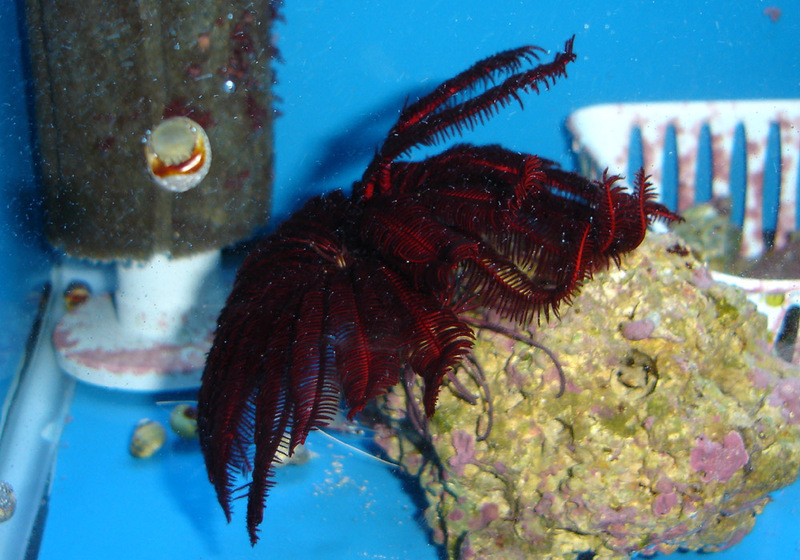 This allows crinoids to move to a location where the current is suitable for feeding and/or to avoid predation. While crinoids are passive suspension feeders, they can crawl about and find locations where currents are suitable for feeding. Many are also nocturnal and hide during the day, which is one of the problems with trying to keep some species in captivity. It’s obviously no fun to have something in an aquarium that hides all day and only comes out only at night to feed. However, there are some species that can be seen on reefs day and night. While there are many nocturnal species that come out and feed at night, others feed during the day and are common sights on many Indo-Pacific reefs. Surprisingly, in addition to crawling around, many feather stars can also swim, typically in response to predation by several types of fishes, crabs, and sea stars (Meyer & Ausich 1983, Mladenov 1983, Meyer 1985). This is accomplished by quickly and alternately raising and lowering their arms. They certainly aren’t fast, and they swim around rather clumsily, but it’s still swimming nonetheless. Crinoids do have their predators, and it’s very common to see them missing one or more arms. However, like sea stars and their other cousins, they can eventually regenerate these if healthy. Here you can see crinoids in motion! At the start, I pointed out that the survival rate of crinoids in aquariums is terrible – and starvation is the primary reason. With the exception of detritus, appropriate food items are typically in short supply in aquariums, and crinoids apparently need far more than they can get. Each species can be very picky about the particles they’ll accept too, and apparently it’s just about impossible to provide enough of the right foods to keep them healthy long-term. Some hobbyists’ first thought is likely something along the lines of dosing a tank with one of the many phytoplankton, zooplankton, or plankton substitute products that are available, but I don’t think you’ll have much luck at all. They simply need more food of the right sort than you can add without negatively affecting your aquarium’s water quality. And, as far as them feeding on detritus goes, there’s certainly no shortage of detritus in most aquariums, but I have to assume that the species of crinoids that feed primarily on detritus are not the species that get collected and imported. Otherwise, at least some offered species should be fine in some aquariums, but they aren’t. In addition, some filter-feeding organisms, like clams, generate currents by some means and actually pump water into their bodies in order to feed. So, they can control water flow to some degree, choosing whatever rate works best for capturing particles with their own unique feeding structures. However, different species of crinoids may require a specific flow rate moving over their arms for them to feed. Studies of some corals have shown that many can effectively capture particles only when water is moving by at a certain speed, and like crinoids, some species prefer faster while some prefer slower movement (see Delbeek 2002 for more on this). This is due to the way that water moves around their polyps and feeding tentacles at different velocities, with food particles being easier to grab when everything is just right. Thus, something like this could also affect an animal like a crinoid, and they may require a certain range of flow velocity in order to capture whatever food is present in the water. In other words, it’s possible that even if you were to add large doses of a suitable food, without the right flow a crinoid may not be able to capture it. Suffice to say, I’ve heard very, very few stories of hobbyists keeping a crinoid alive long-term, and I’m skeptical of many of the survival stories offered on some of the online forums that I read. Some peoples’ idea of long-term is a month, or a few, when it should be years for many creatures. Maybe a crinoid or two can survive long-term in a relatively large well-stocked aquarium with a deep sand bed and/or refugium, etc. with suitable currents, but I have yet to see this with my own eyes. Conversely, what I have seen, after trying my best to keep a handful of crinoids myself over the years, is a slow death over a period of several weeks to a few months. When crinoids begin to starve they actually shrink in size, and their arms get shorter and shorter until they finally die. I haven’t seen any other specific symptoms of trouble other than the wasting away, but the end result has always been the same, and many other hobbyists and authors have reported the same thing. I still see them offered from time to time, but the chances of keeping a crinoid alive long-term in home aquariums are near zero. To make matters worse, crinoids can also be very difficult to collect and typically do not handle shipping very well. The podia are very sticky, and if you ever touch a crinoid’s arms, they tend to tear apart when you pull away. The arms will stick to your fingers and then won’t let go. So, sections of the frail segmented arms end up stuck to your skin and tend to break off and stay stuck to you when you try to let go of one. The little ring of cirri that they use to hold on to the bottom can also get a good grip on things and will wrap tightly around coral branches and such, too. Thus, crinoids can be very difficult to remove from whatever substrate they’re on and to handle through the whole collection and shipping process without tearing them up. As I said, they don’t ship very well at all from what I’ve seen, and I think that it’s probably because it’s so difficult to collect one without injuring it in the process. Of course, they might be especially sensitive to changes in temperature and/or pH and such for some reason too, and may still fare poorly through the process even if uninjured. That’s only speculation on my part, though. Four times per day a mixture of Fauna Marin Ultra Sea fan, Fauna Marin Ultra Clam, and Fauna Marin Ultramin F is added to the aquarium over a two hour period. Fauna Marin UltraMin D and Fauna Marin UltraMin S are also added daily at 7am. Reef Nutrition Rotifeast is added at 6:30am and 6pm. Reef Nutrition OysterFeast is added at 7am. Piscine Energetics or Hikari mysis shrimp is added at 6pm. Reef Nutrition Shellfish Diet is added at 7pm. Argent Cyclop-eeze is added at 8pm. A mixture of Ultra Min F, Argent Cyclop-eeze, and Reef Nutrition OysterFeast is also used to target feed “frequently”. Fauna Marin Ultra Bio and Ultra Bak are added daily. The substrate is stirred lightly to release detritus daily. A bag of Fauna Marin Ultralith stones in the sump is shaken to release detritus daily. So, what does it take to keep water quality where it should be after all this? Water changes of 25% are done twice a week, by doing numerous, slow, one gallon changes at a time. Yes, that’s a whole lot of food and 200% water changes per month – and a lot of time, effort, and money, too. Get the idea? If you ever look around at a natural history museum, or at a rock and fossil shop, you’re almost certain to see fossil sea lilies. These were some of the most common invertebrates around long ago, with many being preserved at least partially intact. While many fossil specimens consist of the theca and arms without the long stalks, there are some that have been found all together, and some of the largest of them had stalks that ranged from 100 to 130 feet in length with crowns that were roughly 3 feet in diameter (Clarkson 1987, Ponsonby & Dussart 2005)! Far more common are fossilized bits and pieces of them though, as all crinoids are composed of great numbers of articulated calcium carbonate bits and pieces called ossicles that are joined by a relatively thin layer of connective tissue and sometimes ligaments. Upon decay of these soft tissues, the ossicles typically just fall apart from each other and get scattered about to some degree. So, those specimens that are semi-complete to complete must have been buried in sediment relatively rapidly before they had time to fall apart, or in areas with very low water flow. On the left is a pair of complete fossilized sea lilies, which are not commonly found. On the right, you can see the segmented stalk of a couple of sea lilies and a deposit of “crinoid buttons” that are commonly found in ancient limestones. Baumiller, T.K. 1997. Crinoid functional morphology. In: Waters, J.A. & Maples, C.G. (eds.) Geobiology of Echinoderms. Paleontological Society Papers 3. Brusca, R.C. and Brusca G.J. 2003. Invertebrates. 2nd ed. Sinauer Associates, Sunderland, Massachusetts. 936pp. Byrne, M. & Fontaine, A.R. 1981. The feeding behavior of Florometra serratissima (Echinodermata: Crinoidea). Canadian Journal of Zoology 59(1). Clarkson, E.N.K. 1987. Invertebrate Palaeontology and Evolution, 2nd ed. Allen and Unwin, London. 382pp. Fossa, S. and A. Nilsen. 2002. The Modern Coral Reef Aquarium, Volume 4. Birgit Schmettkamp Velag, Bornheim, Germany. 480pp. Guensburg, T.E. & Sprinkle, J. 2001. Earliest crinoids: New evidence for the origin of the dominant Paleozoic echinoderms. Geology 29: 131-134. Holland, N.D., Strickler, J.R. & Leonard, A.B. 1986. Particle interception, transport and rejection by the feather star Oligometra serripinna (Echinodermata: Crinoidea), studied by frame analysis of videotapes. Marine Biology 93:111-126. Holland, N.D., Leonard, A.B. & Meyer, D.L. 1991. Digestive mechanics and gluttonous feeding in the feather star Oligometra serripinna (Echinodermata: Crinoidea). Marine Biology 111:113-119. Kitazawa, K., Oji, T., & Sunamura, M. 2007. Food composition of crinoids (Crinoidea: Echinodermata) in relation to stalk length and fan density: their paleoecological implications, Marine Biology 152:959-968. LaTouche, R.W. & West, A.B. 1980. Observations on the food of Antedon bifida (Echinodermata: Crinoidea). Marine Biology 60:39-46. Lukaczyn, M. 2010. A Journey in Crinoid Keeping. Reefs. summer issue. Meyer, D.L. 1979. Length and spacing of the tube feet in crinoids (Echinodermata) and their role in suspension-feeding. Marine Biology 51:361-369. Meyer, D.L. 1982. Food and feeding mechanisms: Crinozoa. In: Jangoux, M. & Lawrence, J.M. (eds.) Echinoderm Nutrition. Balkema, Rotterdam. 654pp. Meyer, D.L. 1985. Evolutionary implications of predation on Recent comatulid crinoids from the Great Barrier Reef. Paleobiology 11(2):154-164. Meyer, D.L. & Ausich, W.I. 1983. Biotic interactions among Recent and among fossil crinoids. In: Tevesz, M.J.S. & McCall, P.L. (eds.) Biotic Interactions in Recent and Fossil Benthic Communities. Plenum, NY. 303pp. Meyer, D.L., LaHaye, C.A., Holland, N.D., Arneson, A.C. & Strickler, J.R. 1984. Time-lapse cinematography of feather stars (Echinodermata: Crinoidea) on the Great Barrier Reef, Australia: demonstrations of posture changes, locomotion, spawning and possible predation by fish. Marine Biology 78:179-184. Mladenov, P.V. 1983. Rate of arm regeneration and potential causes of arm loss in the feather star Florometra serratissima (Echinodermata: Crinoidea). Canadian Journal of Zoology 61(12):2873-2879. Nichols, D. 1960. The histology and activities of the tube-feet of Antedon bifida. Quarterly Journal of Microscopical Science 101:105-117. Ponsonby, D. & Dussart, G. 2005. The Anatomy of the Sea: Over 600 Creatures of the Deep. Raincoast Books, Vancouver. 288pp. Roux, M., Messing, C.G. & Améziane, N. 2002. Artificial keys to the genera of living stalked crinoids (Echinodermata). Bulletin of Marine Science 70(3):799-830. Shibata, T.F. & Oji, T. 2003. Autotomy and arm number increase in Oxycomanthus japonicus (Echinodermata, Crinoidea). Invertebrate Biology 122:373-377. Rutman, J. & Fishelson, L. 1969. Food composition and feeding behavior of shallow-water crinoids at Eilat (Red Sea). Marine Biology 3:46-57. West, B. 1978. Utilisation of dissolved glucose and amino acids by Leptometra phalangium (J. Müll.). Scientific Proceedings of the Royal Dublin Society (Series A) 6:77-85.